The lawn and sloping perennial/shrub garden flanking the public stair and walkway on East Blaine Street. The Central and principal garden section, heavily wooded and laced with trails on its steep eastern slopes. At its center and along its lower, western edge, along Broadway East, perennial and shrub plantings are interwoven with fruit, berries, and vegetable beds. The Rust Garden, named for the huge amount of rusting trash found while creating this section of the garden. As the Rust Garden has some of the best soil and sun in the garden, it is being developed as a mostly perennial garden. The transition zone, the final section, the southernmost portion, where we are beginning an intentional blurring and softening of the frontier between the developed gardens and the wilder, heavily wooded and undeveloped adjacent hillside that is adjacent to the St Marks greenbelt. The public gardens have emerged slowly and incrementally over the years since the Streissguths purchased the land in 1972. At that time, the hillside was studded with multi-trunked big leaf maples (Acer macrophyllum). The canopy&apos;s understory was a tangle of blackberries (Rubus discolor), feral ivy (Hedra helix), horsetail (Equisetum arvense), bracken fern (Pteridium aquilinum), and nettles (Urtica dioica) What is now Streissguth Gardens commenced with simple beautification of the strip adjacent to the Blaine Street stairs and walk. This provided greater pleasure not only to the Streissguths but also to the countless Seattleites who use the stairs and walkway for exercise or egress up and down the west side of Capitol Hill. A hillside trail system followed quickly, launched by a track cut through to admire a native trillium (Trillium ovatum) discovered pushing itself out of the ivy mid-hill. As Ben grew, more trails were built where he and his friends could run and play. Many neighbors began enjoying these paths, and there was finally better access for planting and maintenance. Though no signage has been erected, these trails have been given names. The oldest path is called the Woodland Path; more recent ones are named the High Path, the Rock Wall Path, and the Raccoon Pool Path to name a few. The heavy tree canopy overhead was gradually thinned to enhance views for neighbors above the Garden, to open vistas down the hillside to Lake Union, and to admit more sunlight for newly-planted smaller deciduous trees and shrubs. Lower down on the hillside, a mucky, swampy section was tamed by channeling groundwater into two clay-lined ponds, one being the Raccoon Pool. Both ponds have since upgraded from clay to EPDM liners. Here Ann was able to take advantage of the farm training of her youth, commencing food production on the small, sunny, and level plot abutting Broadway East..
Other specialized sections were established: a rhododendron bank with emphasis on scented varieties and species; a winter garden called The Dell, suggested by many family visits to, and much family enjoyment of, Seattle&apos;s Washington Park Arboretum&apos;s Winter Garden; groups of shrubs and species roses in a sunny area; a collection of hybrid azaleas selected for the soft colors of their blooms; and a grove of stewartia trees. In 1989 Proposition 2, a $117 million King County Open Space and Trails Bond ($41 million for Seattle) was passed by a margin of 2 to 1. This bond issue was used to purchase and preserve significant undeveloped land that was threatened by development. Again, the neighborhood rallied and nominated the three lots south of our garden for purchase (including over 120 letters of support). Throughout the year-long selection process, the lots rose near to the top of the list of parcels recommended for purchase by the city. As it became clear the city was highly interested in the lots, we started to work with the Seattle Parks and Recreation (DPR) on the possibility of gifting our lots conditionally on the purchase of the other three. In 1996 both the purchase and gift were finalized and the city was the proud new owner of a block-long addition to the St. Marks Greenbelt. Though the earlier developers did not succeed in their plans, they left their mark on the land: a jungle of weeds and debris from the drilling and equipment. As we worked to clean up small portions of those lots, a boot path quickly developed from our garden across the T shaped skid road and into the St Marks greenbelt. At that time it was still possible to wander deep into the greenbelt. Over the years the access into the greenbelt has been hampered by tree thinning which has allowed more light, and thus more blackberries and clematis, rather than the earlier ivy covering. Our clean-up efforts turned to gardening efforts and even by 1996 there was already a small collection of plants. After the city&apos;s acquisition, we dreamed of blurring the boundary between our gardens and the greenbelt, and over the years that transition zone has grown while the area awaiting renovation has decreased. As part of his horticulture program at Edmonds Community College, one of Ben&apos;s seminal classes was on public garden management. Finally, we had some foundation for understanding the greater view of public gardening. This course, coupled with his many plant identification classes, spurred Ben to create plant tags and a database of the Garden&apos;s plants so this information wouldn&apos;t get lost over time. Meanwhile, Dan started recording the plants in the garden. Together, these projects have come together to become not only the backbone for our record keeping but also the driving force behind the website. With the huge surge of internet users in the late &apos;90s and early 2000s, we knew this was the way to disseminate information. Major website releases were 2003, 2009, and 2016 (when we finally switched to a mobile-friendly architecture). Plans for a book about the history and vision of the Gardens emerged a couple of years later. We worked strongly on it until Ben started a three-year Bachelors of Landscape Architecture degree program at the UW. After his completion of the program, the book project resumed with the publication by the University of Washington Press, in July 2009. As Streissguth Gardens has continued to grow our vision of the public garden has also grown. During the autumn of 2006, we started a small volunteer program. Since then, hundreds of hours have been donated. A huge THANK YOU goes out to the many people who have helped in the garden. This program has switched focus from maintaining the public garden to the restoration of the southern section of the garden. Also, as part of our longer-term view of the garden we have endowed a small maintenance fund through the Seattle Parks Foundation that we hope will eventually cover one part-time gardener, inspired by some tax advantages that allow taxes to be waved when a person 70 ½ years old transfers money from an IRA to a charitable organization. In the spring of 2008, the city installed a water meter, near the north end of the garages to provide water for the garden. At the same time, Ben started a multi-year project: the installation of an irrigation system for the garden. From the point of the city&apos;s water meter, Ben ran some 600 feet of 1.5" pipe, buried 18" below grade, and some 3000&apos; of wire. We now have 10 points from which we can draw water and 14 points where sprinkler systems will attach. The first three zones were installed in the spring of 2009, along with a solar-powered irrigation controller. While this project is certainly not the most noticeable project ever done in the garden, it is by far both the largest single project and the most disruptive to the garden. Since many of the mainline pipes were run under the paths, we have taken the opportunity to gravel all but the newest paths in the garden. We love the new look and wonder why we didn&apos;t do it earlier. In the fall of 2012 we were the recipients of a generous grant from the Raynier Foundation which helped us to double the amount of irrigation in the garden, thus both decreasing our summer water usage, and freeing up many precious hours. During the summer and fall of 2015, Ben completed the irrigation system (as planned) by installing point source irrigation on the steepest sections of slope which are mostly covered with mature shrubs. Neighbors Phil and Cynthia have been caring for the southern section of the garden, along Broadway, since before it became public property. They have put thousands of hours into the parking strip (often referred to by them as the Husky Garden). After the land became public Cynthia joined an early Adopt-A-Park program to care for the landscape and plant trees. Their dog, Suds, was the first path maker up the hill. Cynthia later built a rough boot trail, which then turned into a more serious trail, and was finally reconfigured into its current state. The path has been named for her. Sometime around 2005 family friend Jake Wimberger approached us wondering if we’d be interested in allowing him to start a forest restoration program in the greenbelt. At the time, all we’d been doing was pulling ivy from the trees. The start of a path from Broadway up the hill had been built to connect to the southern end of the garden, but little else had happened. Jake wanted to tackle the hillside along the eastern boundary of the garden which was mostly Japanese Knotweed (Fallopia japonica), an invasive species. He spent many tireless hours digging and bagging knotweed, and I’m happy to say that it has pretty much been eradicated from our site, though it still forms an awesome boundary on the east side. In addition to clearing, Jake was able to start receiving free plants from DPR. WWe didn’t know much about the program at the time but wish we’d taken more notice of it. The Forest Stewards program is a partnership between DPR and Forterra (a non-profit) dedicated to helping volunteers manage and restore greenbelts. After an initial 1999 / 2000 assessment of the conditions of the forested parks land in Seattle, it was found that Seattle was in danger of losing 70% of its tree canopy in these lands due to invasive species and tree death. The Forest Stewards program was started in 2006, and the St Marks greenbelt was among the early targets. Jake had been working for several years at the south end of the greenbelt, and was able to extend his service to help uswas among the early targets. Jake had been working for several years at the south end of the greenbelt and was able to extend his service to help us. Because of all his great work, in July 2012 (during a freak rainstorm where we received over a ½” of rain in 4 hours) we hosted our first ever large scale volunteer eventBecause of all his great work, in July 2012 (during a freak rainstorm where we received over a ½” of rain in 4 hours) we hosted our first ever large scale volunteer event. DPR and Seattle Parks Foundation had put together a day of service for some of the larger scale firms in the South Lake Union Area. 7 parks around the city were selected, and we received 50 volunteers, most of whom worked the entire day despite the miserable start. They helped us clear 15 yards of ivy from the greenbelt, and clear over 1500 sq feet. A modest start to the restoration, but one that would have taken us multiple years to do. During the course of the year, several neighbors continued the clearing efforts along Broadway, truly transforming the face of the greenbelt. Other neighbors became concerned about the risk of the slide (citing the removal of “plants” from steeper slopes, and the now bare ground). Forest Stewards program reached out to us and offered to have a contract crew come in and plant the steeper slopes (they asked that we refrain from getting on them ourselves). Somehow a miscommunication happened between us, and on the day the work as scheduled to start the crew lead told me they were here to "clear all the non-native plants out of the park". After some panicked phone calls, we discovered that the intention had evolved to include the complete ivy removal on the section that DPR had purchased, and the replanting of 537 native plants. Unbeknown to us, this section of the garden had fallen into the jurisdiction of the Forest Stewards ahad purchased and the replanting of 537 native plants. Unbeknown to us, this section of the garden had fallen into the jurisdiction of the Forest Stewards, taking over stewardship, and allowing Jake to start stewarding a large section of forest on the eastern slope of Queen Anne. We have developed an 11x17 2-page color brochure about the garden. Please feel free to download the pdf (7.2 MB), print it, and bring it with you. Copies are also available at the entrances to the public garden. We have been thrilled to work with the University of Washington Press in publishing our book about the garden: In Love with a Hillside Garden and are very grateful to the Seattle Arboretum Foundation for their co-sponsoring of the book. We are pleased to announce that all the proceeds of the book are donated directly to the Arboretum Foundation. We hope you&apos;ll pick up a copy today, either at the Arboretum gift shop, online We hope you&apos;ll pick up a copy today, either at the Arboretum gift shop, online at the UW Press, or your local small book dealer. If all else fails, you can get it at the major bookstore chains and at online retailers. 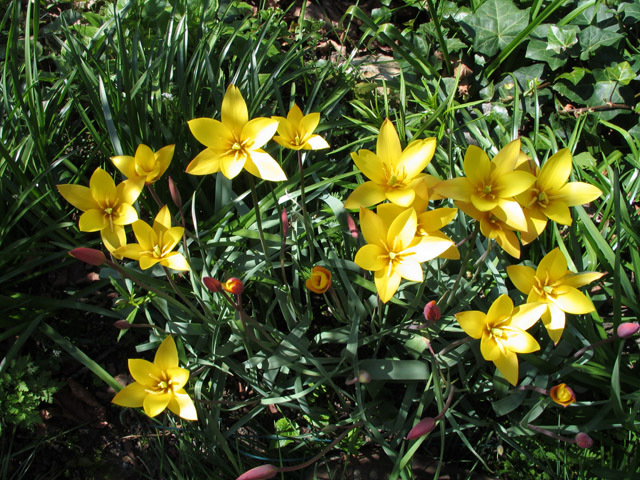 This delicate, lovely tiny tulips are up on the High Path. Look carefully, or you might miss them. Support your local public garden! May 8th is GiveBig here in Seattle, our local day to support non-profits. Streissguth Garden's fiscal sponsor, Seattle Parks Foundation is offering $100 to all it's partners for each new to that partner gift up to 15 per organization. This year's minimal GiveBig donation is just $10. In otherwards, if you've donated to any other group in SPF and you donate just $10 to us, we'll get $110. If you've donate to us in the past and you do so again, you're still a rock star. Ben does a quarterly newsletter, which usually includes some of what&apos;s going on in the garden, a plant profile, perhaps some plants to look for that aren&apos;t in bloom yet, and a new section called Stories from the garden. This new section is where we welcome people to send in a story about the garden. If you have a story you'd like to share, please email Ben. If you&apos;re interested in volunteering in the greenbelt doing forest restoration you can also join that list. Ben usually organizes work parties quarterly, except in the fall where we try and do 4-5 to stay on top of the leafs, plant, and do other maintenance. Lastly, if you&apos;re interested in volunteering to do forest restoration along the Blaine stairs down at Lakeview Blvd, Ben in spearheading a new group there. These parcels are also under restoration through Green Seattle, and are owned by Parks.